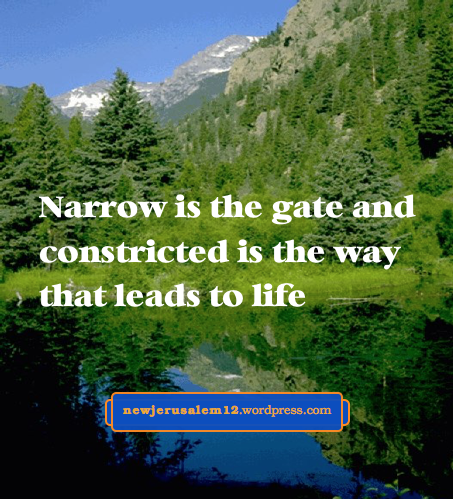 Matthew 7:14: “Narrow is the gate and constricted is the way that leads to life.” We have this life today through regeneration. We take the narrow, constricted way now to the fuller joy of this life in the mani­­festation of the kingdom and to the fullest joy in New Jerusalem. In contrast, a walk on the constricted way is to “flee youthful lusts, and pursue righteous­ness, faith, love, peace with those who call on the Lord out of a pure heart” (2 Tim. 2:22). Our fleeing is our denying. Righteousness, faith, love, and peace are all Christ Himself supplying us to bear our cross on the constricted way. Similarly 1 Timothy 6 speaks of things that cannot come through the narrow gate, such as pride, contentiousness, envy, strife, slanders, and love of money. Verse 6:11 then tells us that to be “a man of God” on the constricted way, we need to flee all the selfish things “and pursue righteousness, godliness, faith, love, endurance, meekness.” All of these virtues are Christ Himself as our life in resurrection and all will continue on the constricted way unto New Jerusalem. *All these “self” characteristics are from New Testament verses.